Since its launch three years ago, Ethereal Summit has grown into a global destination for technologists, startups, entrepreneurs, and investors to engage directly with the latest developments in Ethereum, blockchain, and decentralization. Join us this May 10–11 at Pioneer Works in Brooklyn, New York to explore 2019’s most innovative blockchain projects during hackathons, product demonstrations, immersive activations, social events, and scores of deep dive talks and discourse with leaders representing every facet of the blockchain space — from protocol development to enterprise solutions, law and regulation to design and media. We know that attending a blockchain conference often comes down to ROI for your organization. With so many opportunities for growth at Ethereal Summit, here are a few things to remind your boss when planning your trip to Blockchain Week. Ethereal Summit’s holistic approach to decentralization means agents from every far flung aspect of the blockchain industry are present. It’s the one place that you can not only find out if applying blockchain solutions to your industry or business is the optimal route, but enjoy one-on-one access to those with whom you can partner to build, design, market, and launch. If your focus is on how leading tech companies around the world are integrating blockchain, Ethereal Summit NY 2019 will feature Yorke Rhodes, Co-Founder of Blockchain @ Microsoft, Phil Komarny, VP of Innovation at Salesforce, and Jay Chugh, Senior Director of Products at Oracle laying out the latest in enterprise blockchain integration. Blockchain insiders know that many of the biggest challenges that face the industry are concerned with scaling decentralized networks. Ethereal Summit invites the brilliant minds building the scaling solutions that will push Ethereum into 2.0 to offer intimate insights and updates into the technology. Danny Ryan and Aya Miyaguchi of the Ethereum Foundation will be speaking, alongside Jinglan Wang, Co-Founder of Plasma Group, Giorgios Konstantopolous, Lead Researcher at LOOM Network, and Jack O’Holleran, Founder of SKALE Labs. Want to find out if state channels or beacon chains can open up blockchain integration for your business? Why not ask the people building the solutions while doing some yoga in the Zen Zone? At the heart of the Ethereum community is the global network of developers and BUIDLers bringing the decentralized future into reality one line of code at a time. Ethereal has always placed Dapps at the forefront of proceedings, and 2019 is no different. Founders Kevin Owocki of Gitcoin and Ameen Soleimani of Spankchain will share learnings about what it’s like to build and launch successful dapps on the Ethereum mainnet alongside the likes of Randy Saaf, the brains behind MLB Crypto and Amber Baldet of Clovyr, while Connie Yang, Director of Design at Coinbase will report from the forefront of blockchain UX and design. With hackathons and product demos from the ConsenSys mesh and around the Ethereum ecosystem popping up throughout, the spirit of #BUIDL and the developer community are foundational elements of the Ethereal Summit experience. Government bodies around the world are racing to come to terms with the new paradigms blockchain has created. Eva Kaili, Greek Representative at the EU Parliament joins to offer the latest in Europe, while Patrick Berarducci, Co-Founder of the Brooklyn Project, Joyce Lai of ConsenSys Law and Technology, and Caitlin Long, Founder of the Wyoming Blockchain Coalition will offer an inside look at happenings in the United States on a Federal, State, and regulatory level. Blockchain Week — an ever-evolving cavalcade of blockchain-centric events and conferences that takes over New York City every year — is an annual highlight in the fast-moving blockchain industry. The week-plus series of interconnected events includes headline blockchain conferences like Consensus 2019 and more fine-tuned events like Women on the Block and Fluidity. Ethereal Summit, which takes place at the beginning of Blockchain Week, provides an ideal platform for getting deeply in the midst of the blockchain industry and bringing insights and opportunities back home to your businenss. At the heart of any business is the art of storytelling. At Ethereal Summit, the blockchain industry’s finest storytellers, scribes, activators, and commentators are present to keep the discourse on track and add context to our roles in the decentralization movement. Join Laura Shin of the Unchained podcast, Anthony Pompiliano of Off The Chain, and Nathaniel Whittemore of Long Read Sundays for the ‘inside scoop’ on blockchain and business. Ethereal Summit attracts thousands of technologists, entrepreneurs, and creatives from across the globe that are looking for new ideas, new collaborators, and an opportunity to create meaningful connections. The social events, Ethereal Arts installations, and immersive activations provide opportunities to meet and network with other creatives from around the world while enjoying complimentary food and drinks. Meaningful, career-enhancing, one-on-one connections are a major part of what makes attending Ethereal Summit so valuable. Outside the main halls, Ethereal Summit comes alive as a festival of Ethereum. With a distinct focus on art, wellness, interactive installations, food, and music, Ethereal is about building a culture of blockchain as much as providing the catalyst for development in Ethereum in 2019 and beyond. Tickets for Ethereal Summit NY, this May 10–11th, are on sale now! More 2019 announcements are on the way — Subscribe to the Ethereal Newsletter to stay up to date. 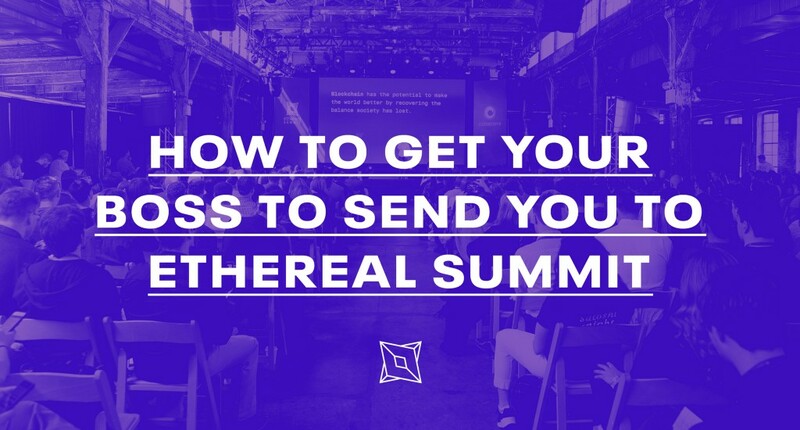 How To Get Your Boss To Send You to Ethereal Summit was originally published in ConsenSys Media on Medium, where people are continuing the conversation by highlighting and responding to this story.